Lindsay Posner's production of Tosca for Grange Park Opera is in many ways emblematic of just how far, and how fast, artistic standards have developed at the third, and newest of the 'three G' country opera houses. It looks handsome (striking sets and brilliant use of all the available space by designer Peter McKintosh). It has strength in depth. It gets full-blooded Italianate playing from the English Chamber Orchestra and fine, idiomatic conducting from the up-and-coming Gianluca Marciano, who has been making a name for himself elsewhere on the English summer circuit as well. So far, so (very) good. And nobody who attended one of the ten performances (I was at the penultimate one) will have felt short-changed by a thoroughly professional, grown-up show. But I also have to report that the impact of this Tosca ultimately fell short of that made by Grange Park's Fanciulla del West a couple of seasons ago. Part of that may be down to the works themselves (one less, one rather more familiar), another part to the casting and the interplay between the onstage characters. In order for Puccini's “shabby little shocker” (Joseph Kerman) to exert its visceral appeal on the senses, an awful lot of things have to come together. That they did not always do so made the emotional appeal of this Tosca underwhelming at times when the music and drama really should sweep you away. Neither shabby nor shocking enough (except for the manner of Scarpia's murder by Tosca), the show was always handsome but just a tiny bit staid. 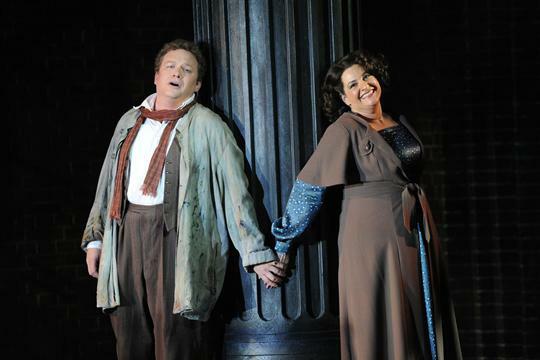 I looked forward keenly to Claire Rutter as Tosca – she was Grange Park's sensational Norma last year and I anticipated a triumph in the role. With the action of this Tosca updated to the Mussolini era, she first appeared in street clothes of the 1930s and made an immediate impact as a movie star sort of diva, a thoroughly modern woman of her day. 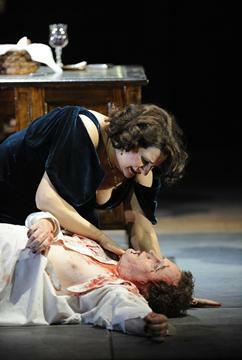 Rutter had thought the character through and moved well, bringing energy and spark to her characterisation. But I found her voice a little on the thin side – I waited for those first moments when the chandeliers ought to 'ping' but they did not. Was she very slightly indisposed? I asked but was not vouchsafed an answer. As the opera progressed Rutter's voice warmed a little and she frequently produced some lovely cantabile singing, but the fullness and richness of sound I had expected simply was not there. Everything I saw and heard was perfectly accomplished, but that vital extra voltage was not in evidence, and even Vissi d'arte was a little pallid. So on this showing, I am not entirely certain it is really 'her' role. This was a shame, because opposite her was a Cavaradossi whose full, open tenor voice is absolutely made for a medium-sized house such as Grange Park – the accomplished Peter Auty. He pretty much nailed the part from the outset, sang with lyricism and grace but always with an edge to the voice that reminds you that with Tosca we are dealing with melodrama, and with pretty lurid melodrama at that. Auty rode the orchestration with ease and gave us an evening of fine singing: he continues to develop well. Completing the trio of principals was Robert Poulton as Scarpia, looking much more lithe, dangerous and thoroughly nasty in the role than Bryn Terfel ever managed for the current Covent Garden production. Here the updating of the costumes and setting suited Poulton's physique du role well, allowing him to come across as both spiv and thug simultaneously. Poulton has a very natural, pure baritonal ring to his voice, singing cleanly and incisively (and with very little vibrato): he rose effortlessly to all the great 'nasty moments' and presided over a tremendous Act One climax, when music can often give way to noise (although that too can be exciting, in its own way). The torture scene in Act Two was as sadistic as ever and a measure of Poulton's success in characterising Scarpia was the audible gasp from the audience as Tosca castrated him at the climax of the act: he had proved to be an excellent villain. With this portrayal, Poulton added to his string of memorable Grange Park appearances – Falstaff, Forester and now Puccini's most lurid villain. The sub-principals were strongly cast, with Henry Waddington a vocally secure and sympathetic Sacristan, Timothy Dawkins an excellent Angelotti, Stuart Kale and Philip Spendley making the most of Spoletta and Sciarrone respectively. Presiding over them all was the flexible baton of Marciano, who kept the work flowing nicely, eased back for the big climaxes and who drew precise chording from the brass and the requisite degree of silkiness in the strings at all the appropriate moments. 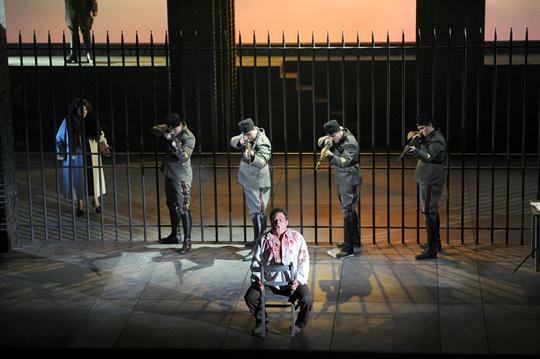 Could Grange Park, even five years ago, have mounted a production of Tosca at all, let alone one with this degree of visual sophistication and professional musical standards? I doubt it, and this production charts their progress. But they will have to continue, for the repertoire in 2011 includes their first attempt at Tristan und Isolde – a challenge if ever there was one.